All systems are human systems, and human-systems engineering cannot advance effectively without knowledge of multicultural factors that influence system design and evaluation. Many of us have used research designs that do not focus on the potential contributing factors that are associated with multicultural users, multicultural contexts, or multicultural ecosystems. Inclusive research validity rests on the premise that the researcher is conducting research activities, analyzing data, and translating results that, when generalized, speak truth for diverse users and ecosystems. This is discussed extensively in many documents, one of which is a well-intentioned book by me and my co-authors (Resnick and Johnson), titled “Cultural Ergonomics: Theory, Methods, and Applications.” If the target users are diverse (gender, age, generation, ethnicity, nationality, race, religion, geographic region, etc. ), then it is our responsibility as scientists and engineers to pay due diligence to inclusive research validity. This applies to almost every system we design. I cannot think of one system where all users are exactly the same on all human attributes – impossible. Yet we continue to conduct analyses that are not telling the whole truth, and we continue to publish work (under peer review) that is accepted without reporting the sample demographics or testing for individual or important group differences. A $5 million grant from the U.S. Air Force will fund a research team led by North Carolina A&T State University that will develop control systems for a new dimension in battlefield strategy: large teams of unmanned vehicles. The five-year project will expand the use of autonomous vehicles, such as drones, to a larger and more diverse scale. The vision is to manage future battlefields with autonomous vehicles working together in the air, on the ground and/or underwater. The vehicles could be controlled remotely by human operators or they could maneuver autonomously in complex environments. Teams of autonomous vehicles working in concert with soldiers, sailors and fliers would be capable of a variety of cooperative missions, such as surveillance and reconnaissance. N.C. A&T is among more than 120 U.S. engineering schools leading a transformative movement in engineering education announced at the White House today. The schools will establish special educational programs designed to prepare undergraduates to solve “Grand Challenges”—complex yet achievable goals to improve national and international health, security, sustainability and quality of life in the 21st century. Together, the schools plan to graduate more than 20,000 formally recognized “Grand Challenge Engineers” over the next decade. 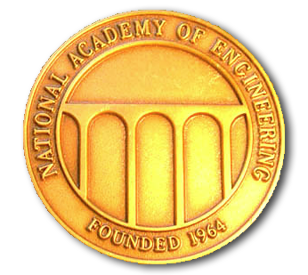 The College of Engineering at N.C. A&T will graduate engineers in accordance with the National Academy of Engineering’s vision for ensuring a competitive engineering workforce ready to create solutions to the complex challenges of the present and the future. The Grand Challenges Engineers Program will emphasize expertise in entrepreneurship and innovation; global and cross-cultural perspectives, and social consciousness with exposure and experience in other areas as specified in the deans’ letter to President Barack Obama. “For the College of Engineering at N.C. A&T, the decision to participate in this initiative was any easy one for our leadership team since the elements central to preparing Grand Challenge Engineers align strongly with our strategic agenda,” said Dr. Robin Coger, dean of the College of Engineering. 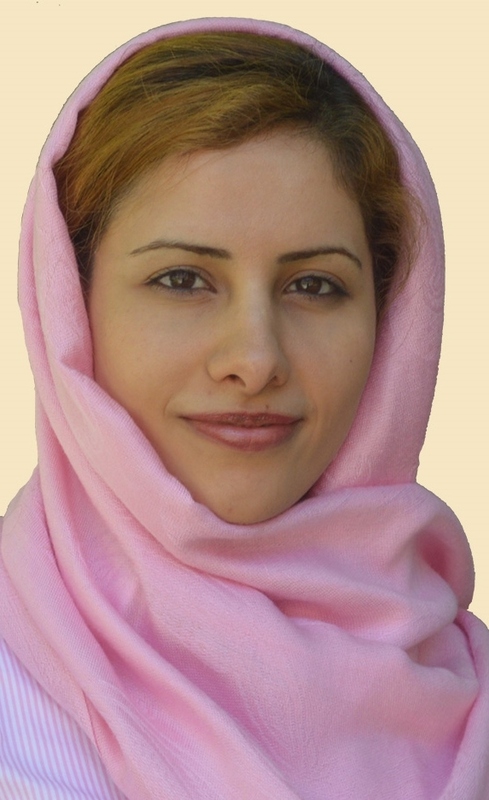 A new chapter of the Institute of Electrical and Electronic Engineers (IEEE) has been established in the Piedmont Triad, led by Dr. Fatemeh Afghah, assistant professor of electrical and computer engineering at North Carolina A&T State University. The new group is a joint chapter of the IEEE Communications Society and IEEE Signal Processing for the Central North Carolina Section. IEEE is the world’s largest association of technical professionals for the advancement of technology with more than 400,000 worldwide. The Central North Carolina section covers the Piedmont Triad area, including Greensboro, High Point and Burlington. As a part of the chapter’s activities, leaders in communications and signal processing societies will be invited to present recent advances in communication and signal processing technologies to students, electrical engineers and professional members in the Piedmont Triad area. The chapter will receive up to $7,000 and support from IEEE to organize technical and professional lectures. To become a member or to learn more about chapter activities, contact Afghah or go to http://www.ewh.ieee.org/r3/cnc/index.html. 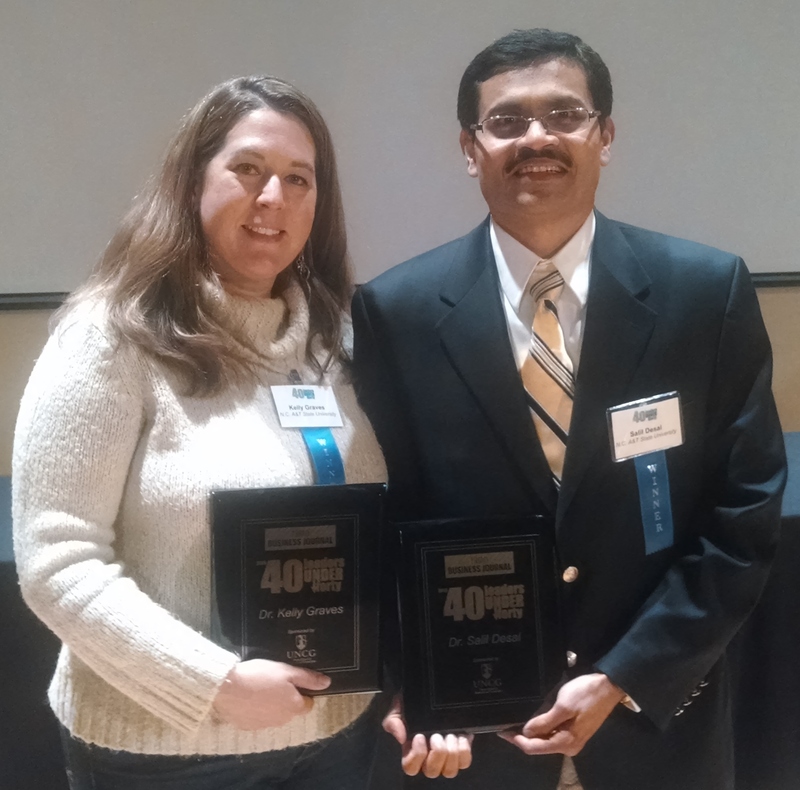 An industrial engineer working at the nano level and a clinical psychologist working at the community level represent N.C. A&T in the Triad Business Journal’s 2015 class of 40 Leaders Under 40 for the Piedmont Triad area. The selection of faculty members Dr. Salil Desai and Dr. Kelly Graves was announced this week. The program sponsored by the weekly business newspaper has now honored six A&T faculty and staff members in the past five years. Desai is an associate professor in the Department of Industrial and Systems Engineering. He was honored for his research in collaboration with high-tech nano and bio companies that has the potential to revolutionize the fabrication of regenerative tissue scaffolds, bio-chem sensors and functionally gradient materials that lead to next-generation devices and systems. Desai patented a major advance in nanomanufacturing, a process that can fabricate selective features at both the micro- and nano-scale. The ability to fabricate structures from the micro-scale to the nano-scale with varied geometry and high precision in a wide variety of materials is important in advancing the practical impact of micro- and nano-technology in the semiconductor, biotechnology and industrial sectors. He has collaborated with NanoTechLabs of Yadkinville to apply his technology to the fabrication of flexible Thin-Film-Transistors for aerospace technologies. Their team has received Small Business Technology Transfer funding from the U.S. Air Force. The innovation was supported by the Oak Ridge National Lab as a disruptive technology. He also serves as an affiliated faculty member of the bioengineering program, an affiliated faculty member of the Joint School of Nanoscience and Nanoengineering, an adjunct faculty member at the Wake Forest University Institute for Regenerative Medicine, and co-leader of research in cardiovascular devices for the NSF Engineering Research Center for Revolutionizing Metallic Biomaterials at A&T. Desai is director of A&T’s Integrated Nano & Bio Manufacturing Laboratory, a clean room in which his students conduct fundamental research toward developing novel nano/bio manufacturing processes for a variety of applications. He is an active researcher and educator in the interdisciplinary fields of nano/micro and bio manufacturing. 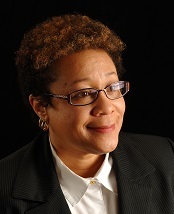 Graves is executive director of N.C. A&T’s Center for Behavioral Health and Wellness, an interdisciplinary group of professionals in counselling, criminology, health education, peer support, psychiatry, psychology, public health, social work, substance abuse counselling, and wellness coaching. They provide community-focused, evidence-based, and culturally competent behavioral health services. Graves created the Center to bring the community a new level of trauma-focused services. Since it was established in 2012, she has grown the center’s staff from four to more than 20 and secured over $2.5 million in funding. She has led the development of partnerships with 42 public and private organizations – including the Greensboro Police; Guilford County Schools; Guilford departments of public health and social services, and other state and local public agencies; and 20 private agencies such as Family Service of the Piedmont, Guilford Child Development, and the Women’s Resource Center. The Greensboro Child Response Initiative, a partnership with the Greensboro Police Department to provide advocacy services and resource linkages to children and families experiencing violence or trauma. Guilford County Child Trauma Task Force, a project co-led by the center and the Department of Social Services to create a systemic approach to prevention, education, and awareness about child trauma. Project I-CARE, a collaboration with Triad Adult and Pediatric Medicine to offer co-located, integrated physical and behavioral health services for uninsured patients. Services are also available in Spanish. Graves is a tenured faculty member in the Department of Human Development and Services in the School of Education. She teaches at the masters and doctoral level. She also trains professionals across the country on the implementation of evidence-based practices in behavioral health settings. Graves conducts research on the integration of behavioral and physical health, integration of co-occurring disorders into treatment, trauma, poly-victimization and other topics. She shares her expertise nationally as a consultant with the U.S. Department of Justice, the Bureau of Justice Assistance, and through her books and articles. UPDATE: New venue for this week’s ERC seminar and new set of locations for the seminars this semester. Two weekly seminar series will begin this week for the fall semester. 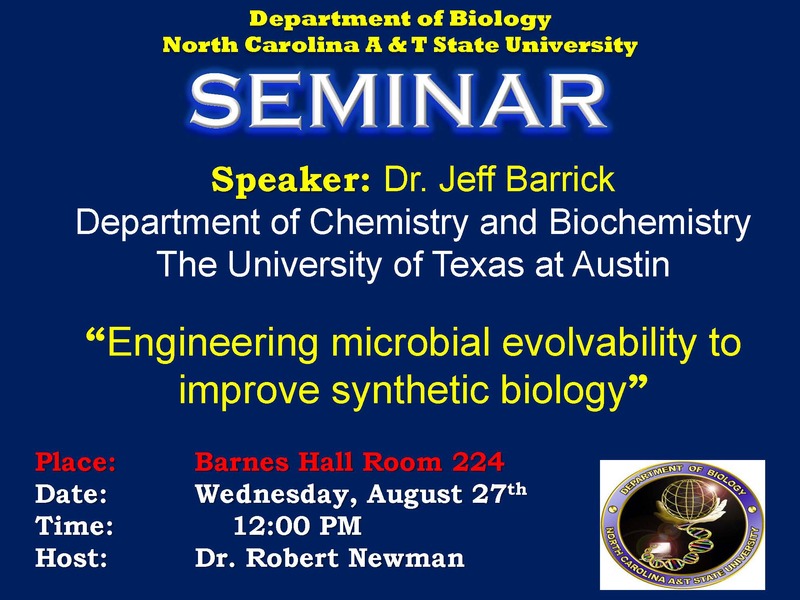 The Biology seminar series is held on Wednesdays at noon in Barnes Hall Room 224. 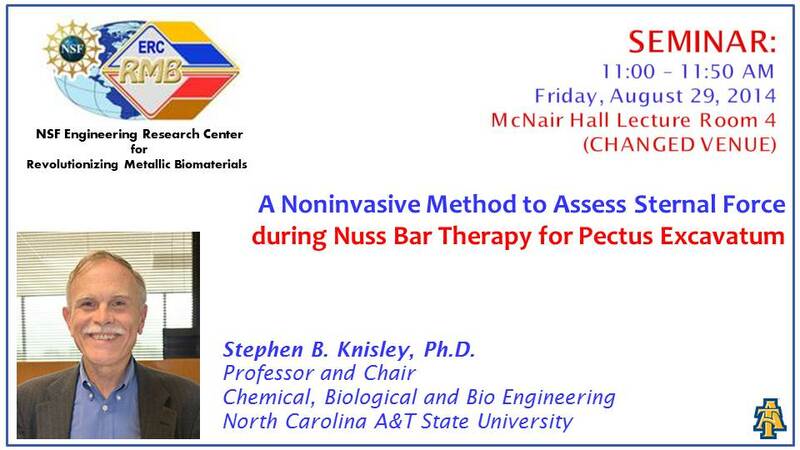 The Engineering Research Center seminars are held on Friday, 11 a.m. Check weekly for location, which alternates among three locations in McNair (Room 128; Room LR4, an A/V- and distance learning-enabled classroom, and the Auditorium). Engineering Research Center: Friday, August 29, 11 a.m.
Pectus excavatum (PE) is the most common chest wall deformity. In PE patients, the middle lower portion of the sternum is depressed producing concavity of the anterior part of the chest wall. Correction is accomplished by using minimally invasive technique of chest remodeling developed by Dr. Donald Nuss in 1987. A curved metal bar is implanted to lift the sternum to its normal position. Upward force from the bar is opposed by downward sternal force, partially flattening the bar. The bar may be removed 1-2 years later without PE recurrence provided that sternal force has become negligible. There is currently no method available for the in vivo measurement of sternal force. This project sought a noninvasive assay of sternal force using bar end-to-end distance.